Therapy Hair Studio > Blog > Therapy Hair Studio > Get red-carpet ready at Therapy’s Friday night Fix-up! 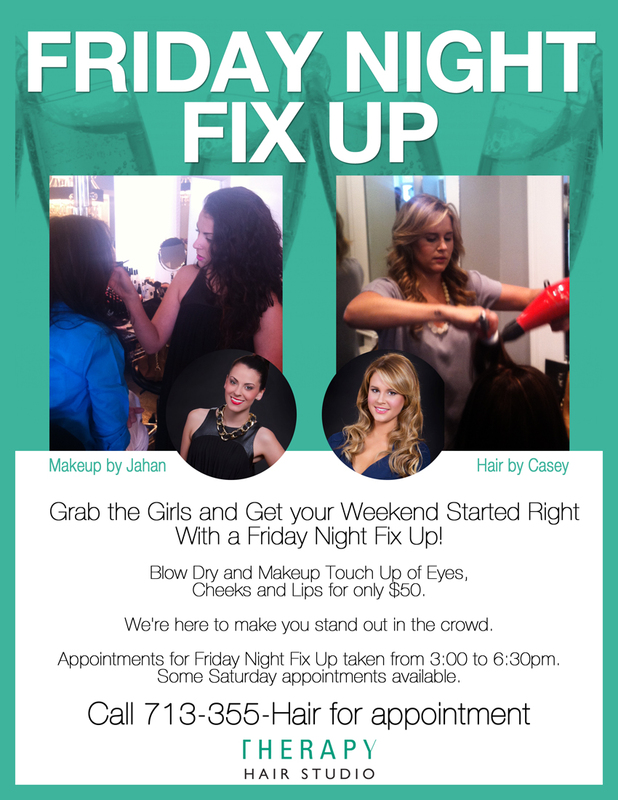 Get red-carpet ready at Therapy’s Friday night Fix-up! Plan your outfit and let Jahan and Casey take care of the rest. Have a big event coming up or a hot date? We’ve got your beauty team ready for our ever popular Friday night fix-up. The package includes a shampoo and blowout plus a makeup touch-up to get you ready for any occasion. You will walk out feeling like you are ready for the red carpet with our talented makeup artist Jahan and Casey. Book your appointment now! And at $50, bring a friend and make it a girls night! Appointments are limited and start on Friday at 3pm, a few appointments taken on Saturday, call 713-355-HAIR to book now.